Liberty 7’s Slots is a 3 reel 1 payline video game released by Vegas Technology. This slot is quite simple to play. All you need is to play with maximum 3 coins per spin in order to get the opportunity to win the top jackpot of 10,000 coins. Enjoy the colours of liberty that present you such icons as Red Seven, Blue Seven, White Seven, Red Bars, Blue Bars and White Bars. There are no complicated rules or too much winning combination to remember. Even if you get just one Seven on the reels the prize is guaranteed. The highest jackpot is 10,000 coins or $100,000 for 3 any Sevens if you bet 3 coins per line. The second jackpot is 5,000 coins or $50,000 for 3 Red Sevens if you bet 3 coins per line. 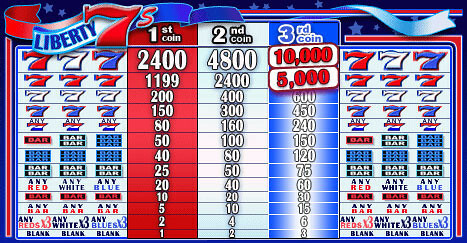 The third highest jackpot is 4,800 coins or $48,000 for 3 any Sevens if you bet 2 coins per line. 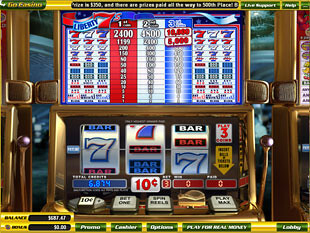 Liberty 7’s slot machine is a traditional game with quite impressive prizes that can be up to 10,000 coins or $100,000. All you need is to play with maximum 3 coins, rely on your luck and maybe these sevens really present liberty.